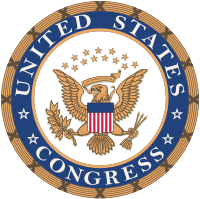 Kongres ar Stadoù-Unanet pe, aliesoc'h, Kendalc'h ar Stadoù-Unanet (saozneg: United States Congress) eo parlamant divgambrek Stadoù-Unanet Amerika, gantañ ar galloud lezenniñ. Ar Sened (United States Senate), ar gambr uhel, gant 100 dileuriad (2 evit pep Stad). Ti an Dileuridi (United States House of Representatives), ar gambr izel, gant 435 dileuriad (anvet evit 2 vloaz). Cheñch a ra o niver hervez ar Stadoù, diazezet eo an niver-se war pouez o foblañs. War-eeun e vez dilennet an holl zileuridi-se. Er C'hapitol, e Washington D.C., e vodont. ↑ Martial Menard, Dictionnaire français-breton, 2012, p.294b. ↑ Kenan Kongar, "Un damsell war istor Stadoù Unanet an Amerik", Al Liamm niv. 184, p. 379. Kemmoù diwezhañ degaset d'ar bajenn-mañ d'an 12 Kzu 2014, da 16:11.